All the Engineering colleges situated in Delhi will consider the JEE Main score for admission to the B.Tech Programme. Candidates have to qualify the examination. JEE Main exam will be conducted by NTA to offer admission into B.Tech & B.Arch courses. Some Universities will organize their own examination for providing admission to the engineering courses such as IPU CET, etc. Candidates, those want to get admission to the M.Tech course, they must have to clear GATE examination. Jee main score 84%tile . Pl help for btech good colledge in delhi. 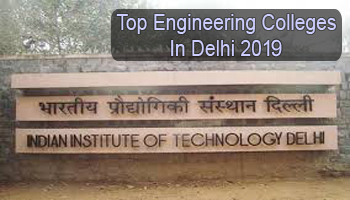 Complete list of renowned engineering colleges in Delhi is given in the article. Please confirm if IP university, Delhi is going to consider JEE result or their own CET for 2019 admission. Kindly help in B.Tech admission. % is 85.
i am mining engineering degree holder. so i need to study a master program in mining engineering. for a time being i am a lecturer of Aksum university in Ethiopia……….so please help me to get this opportunity in your institutions when the application form is open…………..
you can apply through GATE exam, for admission to Masters courses in Mining. I am a bangladashi student. I want too admited myself in india.so what can I do admitted myself.? Dear Sir, 1) What is the admission procedure for DTU (delhi) for studying B.Tech-mathematics and computing . 2) Is there any entrance test conducted by good colleges in Delhi that provide B.Sc(Honours) in Maths? Why I ask is I have poor aggregate marks in MPC? I want too read engineering programs? can I..?